Provides a detailed and systematic description of the Method of Moments (Boundary Element Method) for electromagnetic modeling at low frequencies and includes hands-on, application-based MATLAB® modules with user-friendly and intuitive GUI and a highly visualized interactive output. Includes a full-body computational human phantom with over 120 triangular surface meshes extracted from the Visible Human Project® Female dataset of the National library of Medicine and fully compatible with MATLAB® and major commercial FEM/BEM electromagnetic software simulators. This book covers the basic concepts of computational low-frequency electromagnetics in an application-based format and hones the knowledge of these concepts with hands-on MATLAB® modules. The book is divided into five parts. Part 1 discusses low-frequency electromagnetics, basic theory of triangular surface mesh generation, and computational human phantoms. Part 2 covers electrostatics of conductors and dielectrics, and direct current flow. Linear magnetostatics is analyzed in Part 3. Part 4 examines theory and applications of eddy currents. Finally, Part 5 evaluates nonlinear electrostatics. Application examples included in this book cover all major subjects of low-frequency electromagnetic theory. In addition, this book includes complete or summarized analytical solutions to a large number of quasi-static electromagnetic problems. Each Chapter concludes with a summary of the corresponding MATLAB® modules. 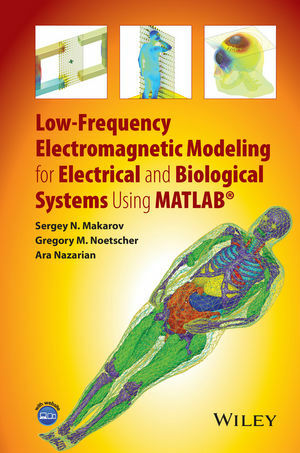 Low-Frequency Electromagnetic Modeling for Electrical and Biological Systems Using MATLAB® is a resource for electrical and biomedical engineering students and practicing researchers, engineers, and medical doctors working on low-frequency modeling and bioelectromagnetic applications.